Biggie issued yet another interesting Task to keep our Chasers on their toes. This one was called the Airtel Arena Showdown where the aim of the Task was to break your opponent’s hearts. Sounds intriguing. 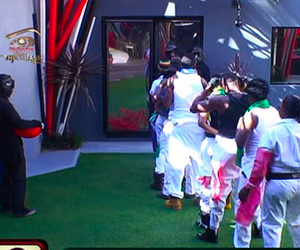 The Task: Housemates were required to play the game ‘Paintball’ where both Houses had their own side of the arena. The Housemates had to shoot and break the other House’s hearts in a shooting relay while staying behind their cover at all times and not move into the area between the two sides. Each House chose one Housemate to start. This Housemate had one paintball to shoot at a heart. When done, they went back to their team and the next Housemate had their turn. There was a Marshall who would disqualify cheating Housemates and whose rules had to be followed to the tee. The Task was intended to last until one House had broken all the other House’s hearts.